Freddie Kitchens coaching at the Browns practice. CLEVELAND — One week into their expansive coaching search, the Browns are huddling. After conducting interviews with seven candidates in seven days, general manager John Dorsey and members of the team’s search committee, which includes owner Jimmy Haslam, were not expected to meet with anyone on Tuesday and could be evaluating their next move. It’s possible they’ve already found Cleveland’s ninth coach since 1999 or Dorsey and Co. could be waiting to speak with assistants on teams still in the NFL playoffs. To this point, the Browns have met with interim coach Gregg Williams, offensive coordinator Freddie Kitchens, former Indianapolis and Detroit coach Jim Caldwell, Vikings offensive coordinator Kevin Stefanski, Saints tight ends coach Dan Campbell, Patriots linebackers coach Brian Flores and Colts defensive coordinator Matt Eberflus. Dorsey was expected to meet with former Green Bay coach Mike McCarthy, but nothing has been scheduled. Dorsey and McCarthy spent seven years together working with the Packers, and by all accounts, the two men have a solid relationship. McCarthy’s pedigree as a Super Bowl champion and his years working with Brett Favre and Aaron Rodgers make him appealing. But he’s also interviewed with the Jets and could land in New York. One coach no longer in the mix is New England offensive coordinator Josh McDaniels, who said Tuesday “the book is closed” on him interviewing for head coaching jobs. Dorsey has tightly guarded his plans during the search, much the way he did leading into the NFL draft when he stunned experts by selecting quarterback Baker Mayfield with the No. 1 overall pick. Obviously, that pick proved to be brilliant and Browns fans are trusting Dorsey to choose the right coach to pair with Mayfield. At this point, Kitchens, who revamped the team’s offense in the season’s second half, could be the front-runner. He’s the people’s choice and players love him. 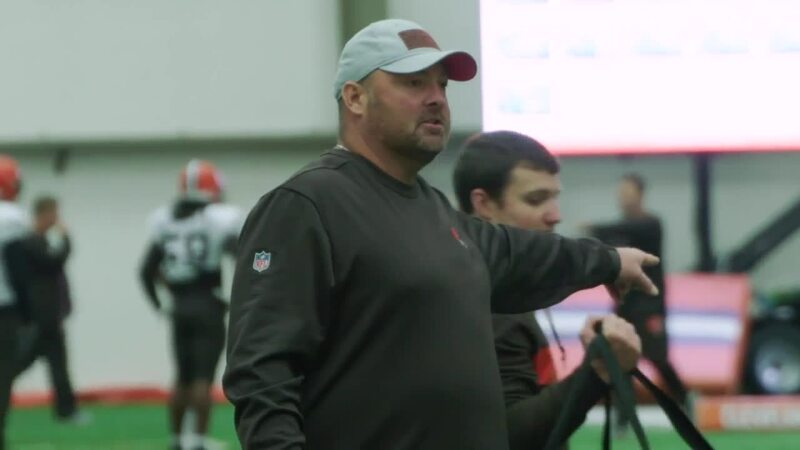 The 44-year-old Kitchens is the most recent candidate to meet with the Browns, formally interviewing with Dorsey and the committee members on Monday. He got a chance to present his long-term vision for what the Browns could become under his guidance. He’s already shown them what he can do in eight games. Once Kitchens took over Cleveland’s offense on Oct. 29, Mayfield took off. He threw 19 of his 27 touchdown passes — a league rookie record — in the final eight games and Mayfield completed 68 percent of his passes. Also, Kitchens designed play calls that played to Mayfield’s strengths, allowing the mobile QB to get out of the pocket to make plays and avoid pass rushers. Mayfield was sacked 20 times under coordinator Todd Haley, and just five with Kitchens in charge. Kitchens and Mayfield also formed a close bond, something none of the other candidates could claim when they sat in front of Dorsey and Haslam. That relationship could seal the deal for the Browns as they envision Mayfield being the franchise’s face behind the face mask for the next decade. If Kitchens is hired, it’s a stunning ascension for the former Alabama quarterback, who began the season as Cleveland’s running backs coach following 11 seasons with Arizona. Kitchens endeared himself to his players with a no-nonsense approach, easygoing style and willingness to include them in decisions. While building game plans, he empowered his players by asking them what plays they were most comfortable running. And Mayfield wasn’t the only player who developed under Kitchens as offensive left tackle Greg Robinson and wide receiver Breshad Perriman, cast-offs at recent stops, made significant contributions. The Browns think so much of Kitchens that they blocked other teams from interviewing him. Kitchens began his coaching career in 1999 at tiny Glenville State in West Virginia and was on three other campuses before jumping to the NFL as Dallas’ tight ends coach in 2006. He’s never taken his climb for granted.